Intel's eighth-generation Core CPUs, codenamed Coffee Lake, will launch in the second half of 2017—far earlier than the 2018 launch period suggested by supposed product roadmaps leaked last year. At its Investor Day event last week, Intel confirmed that its 8th-gen chips will once again be based on a 14nm process, much like Broadwell, Skylake, and Kaby Lake before it. The first Broadwell chips were released way back in 2014. Intel officially abandoned its previous "Tick-Tock" strategy—with each "tick" representing a die shrink and each "tock" representing a new microarchitecture—in early 2016, and instead promised a three-phase model of Process, Architecture, Optimization. But now, with Coffee Lake, it seems Intel might have abandoned that new model, too. Technically, Kaby Lake is the "Optimization" to the "Architecture" of Skylake and the "Process" of Broadwell, which makes the early launch of Coffee Lake on 14nm something of an anomaly. Intel is promising around a 15 percent jump in performance versus Kaby Lake, although it hasn't noted whether this refers to desktop or mobile chips. Intel promised a similar performance jump between Skylake and Kaby Lake, but this was largely based on a bump in base clock speed for desktop chips; IPC (instructions-per-clock) remained identical. 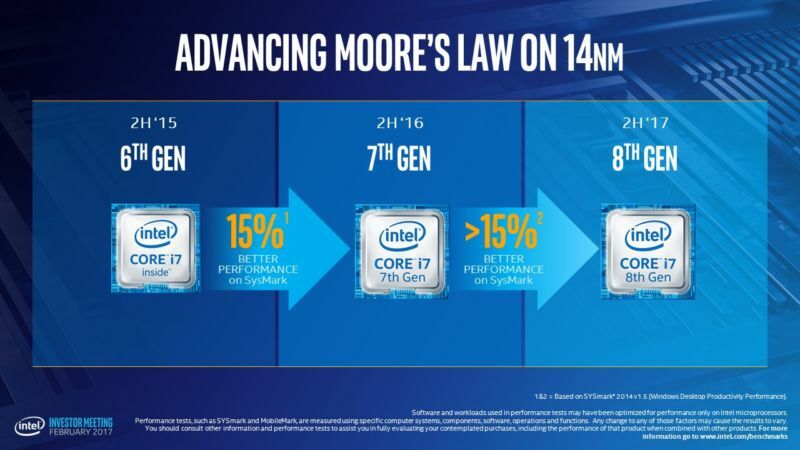 Where Intel will find the required performance improvements given it's stringing out 14nm for another year remains to be seen, although—as AMD has demonstrated with its Bristol Ridge CPUs—there are efficiency gains to be had with some clever engineering. Intel is keeping schtum about the full Coffee Lake lineup, but it's expected to include a six-core CPU as part of the standard range of i7 products. Currently, Intel only offers more than four cores in its Xeon and Extreme Edition ranges, which typically retail at much higher prices. The Coffee Lake chips will go head-to-head with AMD's upcoming Ryzen CPUs, which launch in March. Ryzen will feature eight cores and 16 threads in its top-end part, with six- and quad-core versions making up the rest of the line. Pricing for AMD Ryzen is yet to be announced. Intel's highly anticipated Cannon Lake CPUs—which are based on a new 10nm process—do not currently have a release date. However, when they do eventually arrive, Intel has said that "Data centre [is] first for [the] next process node," meaning enterprise users will get their hands on their chips before consumers. Intel also noted that future process uses will be "fluid," depending on the market segment, meaning 14nm may be sticking around for longer than some had hoped. The first 10nm chips consumers will get their hands on won't come from Intel but from Samsung and Qualcomm. The upcoming Snapdragon 835 SoC will be built on Samsung's 10nm process, enabling a 30 percent smaller die size and a claimed 40 percent reduction in power consumption. No devices using the Snapdragon 835 have been announced, but the chips are in production and are promised to arrive in the first half of 2017.